Buffalo Chicken Bubble Up - chicken, buffalo sauce, Ranch and cheddar tossed in biscuits. Crazy good! 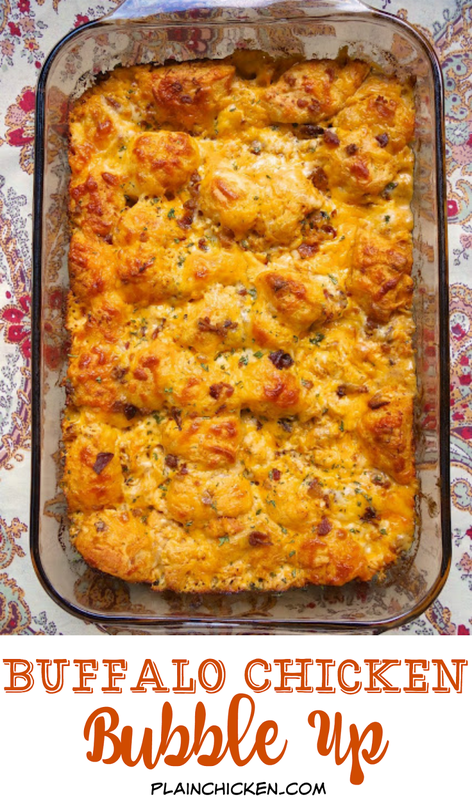 My husband could not stop raving about this casserole. He asked me to make it again the next night! Great for football parties too! This is man pleasing food at its best! Chicken Legs absolutely LOVED this dish. He couldn't stop talking about how good it was the entire time he was eating it. I agree, this was really, really delicious. 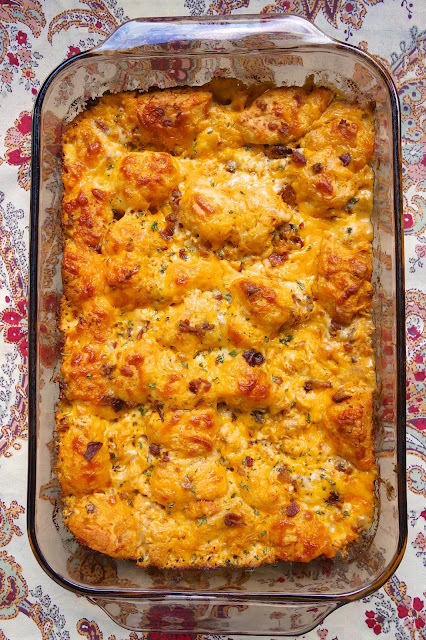 This dish is like eating buffalo chicken dip for dinner. I've always wanted to do that! 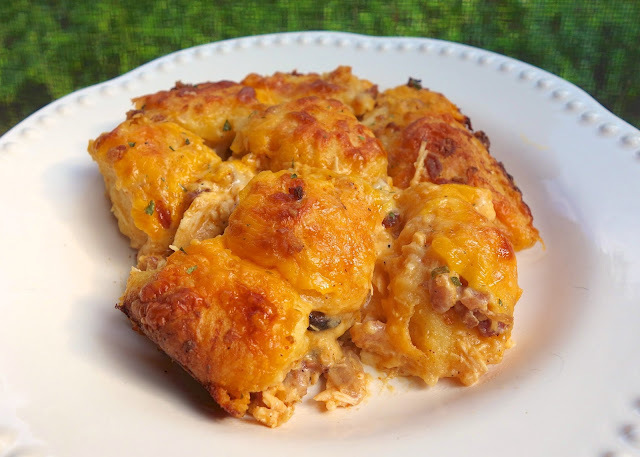 It is packed full of chicken and ooey gooey cheesy goodness. Feel free to change the cheeses. Obviously bleu cheese would be great in this. You can control the amount of heat in this dish by adding more or less buffalo wing sauce. I used some chopped rotisserie chicken (my favorite shortcut) and this came together in no time. This would be great for lunch, dinner or a tailgating party. Preheat oven to 375ºF. Spray a 9x13-inch pan with cooking spray. Toss chopped chicken with buffalo sauce. Cut biscuits into quarters. In a large bowl, toss biscuits with Alfredo sauce, bacon, chicken and half of cheese. Pour mixture into prepared 9x13-inch pan. Top with remaining cheese. I love these bubble up type recipes. This one sounds delicious! I wanted to tell you that I made your Cinnamon Roll Pulls a few weekends ago for a family brunch and it was a HUGE hit!! Thank you for sharing so many great recipes! Terry - I am so happy to hear that! Now I want cinnamon rolls. Could you toss the biscuits in Blue Cheese or Ranch instead? Mom2-4-T's - you could certainly give it a try! Sounds good to me. Jill - I bet the Ranch on top was great! I will do that next time. It was SO great to finally meet you in person! This would be a sure winner in our house, thanks for sharing! Awesome idea! 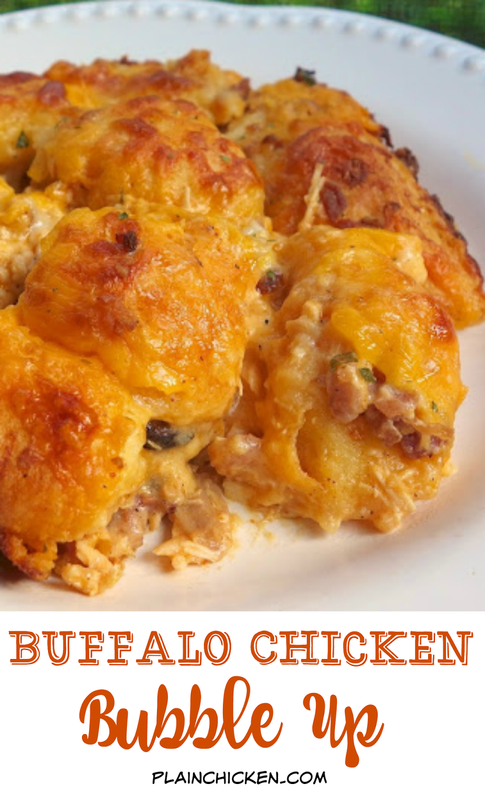 I never thought to do buffalo chicken as a casserole. It looks delicious and is especially perfect for football parties. Does anyone know if this would freeze well? I am always trying to find things to make and freeze in individual servings for my son in college. Thanks! Elise - if you do freeze it, you will need to bake it first. The biscuits won't rise properly if you freeze them uncooked. Never tried a bubble up recipe before, but this one looks delicious! This was SO good. I've been making your bubble ups for a little bit now and I usually split the recipe into 2 9" cake pans so I can have whatever I want and my husband can have the toppings he wants. I followed your lead on the alfredo sauce and created a philly cheesesteak bubble up with ground beef, peppers and onions. It was a keeper too. I'm so glad you tried these. I'll definitely be making these two again. Kathy - great creation! I will definitely be giving it a try! Steph... I am lo - carb. Can you eliminate the biscuits? This is an interesting idea and I'm definitely going to have to give it a go, especially using ranch dressing. I might have to consider adding some finely chopped vegetables so I can stretch it to feed to hungry men in my home! @Julia ... you might consider using similarly sized slices of sweet potato instead of biscuits. It won't quite be the same, but should work. Is wing sauce the same as barbeque sauce? We've never had any "bubble-up" recipes! This one is gonna be on my rotation!